Our instincts drive us to protect our children; making sure they are safe, happy, and secure. In their early months and years we feed our kids healthy foods, keep them clean, and go out of our way to ‘baby proof’ the house. However, if we aren’t tending to their oral health needs on top of all the other safety precautions we take, then we fail. A poor oral hygiene routine is a gateway for cavities, bad breath, health problems, and illness. As a pediatric dentist Appleton residents trust for their children’s oral health and cavity prevention needs, let us help you build a great routine that will keep your loved ones happy and healthy. Parenting comes in many forms; some parents coddle their kids while others hover. Some teach by example while others let kids learn the hard way. Regardless of what type of parent you are or strive to be, we can all protect our children’s oral health. One of the main reasons our Appleton dentist recommends introducing children to our office before they turn one is to have a healthy oral hygiene routine right from the start. 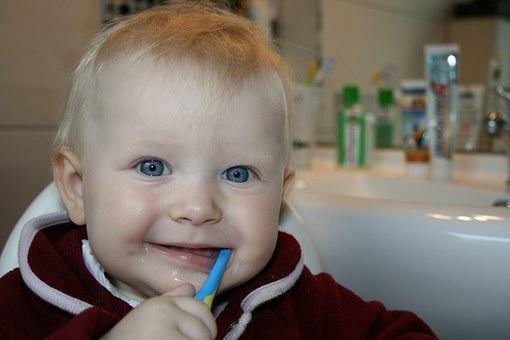 A great oral hygiene routine begins at birth. By introducing a healthy regimen right away, you are helping set your child up for oral health success. In the beginning, simply wiping your child’s gums with a soft and clean, damp cloth is all that’s needed. This action wipes bacteria off of the gums and introduces your child to an oral health pattern. Clean the gums twice a day; just as you would brush your own teeth twice each day. When your child begins teething, it is a great idea to upgrade to a soft-bristled tooth brush and water. Dental professionals as well as our Appleton dentist Dr. Keta recommend brushing teeth two times a day. Gentle circles clean the teeth and gums and remove plaque and bacteria. At this stage, flossing also comes into play. Flossing should be introduced into your oral hygiene routine as soon as two teeth grow in next to each other. Make brushing and flossing a fun habit that children learn to expect and enjoy. A clean mouth and a great smile make everyone happy. After your child reaches 1 year of age, we recommend if incorporating fluoridated toothpaste, to only use an amount the size of a grain of rice. When your child is nearing their 1st birthday, celebrate your dedication to good oral health with a trip to our amazingly fun Appleton dentist office. Visits to the dentist early in your child’s life set them up for a rewarding smile. These visits, every six months, introduce kids to our chair-side manner, our fun office, and our kind and caring staff. We love creating positive dental experiences for children and look forward to building a great oral hygiene routine with them as they grow up. It’s hard to believe how quickly our little ones will grow and begin forming their own habits. Before too long, they’ll be begging to brush their teeth on their own. Luckily, by setting a great example and teaching the importance of oral health early on, you can be confident that you have helped your child create a health routine that will grow with them the rest of their life. Look to our Facebook page for more health tips about establishing a great oral hygiene routine and to learn more about our office.